For years I've had a not-so-secret love affair with Buffalo. Hamilton has never suffered the extreme levels of decline as Buffalo, but we can certainly learn from its examples, not only of what not to do but also of what to do. We hung out in Buffalo's Elmwood Village on the weekend. It's a great neighbourhood with people everywhere. It has challenges, including parking, but they're the challenges of a neighbourhood in ascendance, not a neighbourhood in decline. Delaware Park was packed with families on a Sunday night. Folks in our group said, "Why can't Hamilton have this?" referring to the street lined with patios and people walking and using bikes. The short answer is that we still think we need our streets to be dead freeways and our buildings need to be one-storey boxes with big parking lots. Buffalo is currently developing a new land use policy called Green Code. It's a form-based code to replace the zoning code that has ruled building in the city for the past 60 years. The strategy [PDF] is simple: "Fix the basics, build on assets, and embrace smart growth and sustainability." Single-use zoning rules kill development dead. The old zoning rules in Buffalo are part of why its light rail transit (LRT) line has not performed better at attracting new development: investors were interested but suburban-style building rules got in the way. The Green Code abandons the old approach of use-separated zones and low-density, car-dependent design with one-storey businesses surrounded by parking, and replaces it with a new code that "focuses on the appropriate form, scale, and character of development. It addresses the relationship between building facades and the public realm, the form and mass of buildings in relation to one another, and the scale and type of streets and blocks." The goal is dense, mixed, thriving walkablke neighbourhoods supporting economic centres across the city. The new rules make it easier to restore and adaptively reuse old buildings, and new buildings will fit better into the urban fabric of the neighbourhood. Buffalo is also planning to eliminate parking requirements, the dreaded sourge that is familiar to anyone in Hamilton who is eager for urban revitalization. Buffalo's new land use plan also comes on top of its ongoing bike investments, greening their streets with storm-water planters, and generally working extremely hard to revive their urban, walkable neighbourhoods. Elmwood is one lane each way, has 24-hour curbside parking and carries 17,000 cars per day in various spots, in addition to being a public transit route. In Hamilton, we believe Main King, and Cannon Street each need to be four- or five-lanes wide. Why? No reason. What's missing in Hamilton is a little thing called vision. And it's not just our streets. Our planners panic when an entrepreneur proposes to open an ice cream shop in a storefront next to a park in the middle of a lively mixed neighbourhood. We just had a proposal for just that at the corner of Locke and Peter, a building that has recently been a yoga studio, used bookstore and variety store. The city said it has to revert back to residential zoning and that the investor should try to open a store on King Street instead, because that's where commercial development should go. Would you want to open a store based on foot traffic next to four or five lanes of roaring traffic on King? Some cities lead their way out of hard times. Others make an art of lagging. 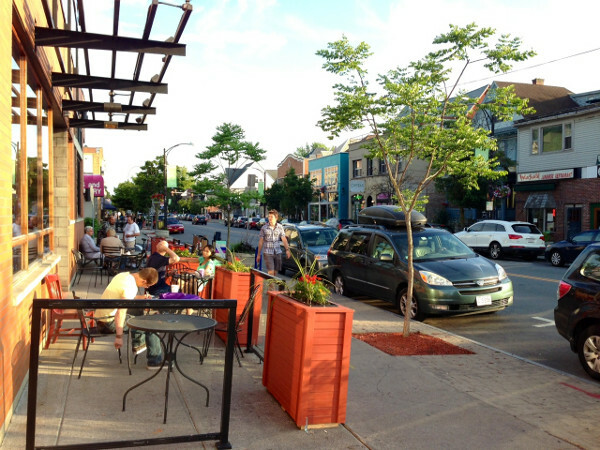 Buffalo's Elmwood district is demonstrating that success can be developed in any urban area when the goal is to create vibrant business districts and residential neighbourhoods instead of merely treating them as freeways to somewhere else. Kudos to them for leading and showing vision even in the midst of very difficult economic circumstances. Hamilton can absolutely see the same vibrancy and success in our older urban neighbourhoods if we simply muster up enough vision and leadership to make it happen. The uncontroversial approach of converting Hamilton's side-streets back to 2-way would easily help this happen. Only the most hard-core of Hamilton's 1-way boosters demand that the city's non-truck-route secondary roads stay 2-way. There's just a lack of political will at City Hall to change, say, Bold Street to 2-way. And yes, City Hall needs to cut away the piles of red tape, or we need to cut away the piles of flab at City Hall. I live not far from that intersection at Peter and Locke and would love to see a small business there! We need to think about how we want our neighbourhoods to look, feel, and function, and then implement the tools to get there. (I love the idea of revamping the zoning model entirely.) We need to not be content to say "this is the way we've always done things." I think that's the real shame in all of this - that a building is going to lie empty and useless rather than be redeveloped because the costs of jumping through the hoops that the city itself has put up, are prohibitive for most people. Buffalo has a guy like Eddie Friel. Hamilton has a bunch of career politicians who would have great difficulty in finding gainful employment anywhere but in their current positions. There is a reason they never leave of their own accord! Unfortunately, them leaving on others accord happens very infrequently and at a glacial speed. We also love Buffalo and have been in this neighbourhood a few times over the last few years. It has the kind of feel that Bloor St has: lots of people out and about, a major thoroughfare but also a small neighbourhood feel. Hamilton could definitely learn from what they are doing there. Thanks for sharing the Green Code info. Are city staff the slightest bit embarrassed or apologetic about these things or do they simply not get it? Maybe a bit hyperbolic but, "I was just following orders." Buffalo is amazing. We venture down there almost monthly, in fact. There are a number of great neighbourhoods in the city, in addition to Elmwood: Allentown/Allen Street (historic district with galleries, a gay section, historic homes), BlackRock (an old part of the city which is seeing a rebirth), Hertel (some great stores, the road needs some calming), and even downtown (pockets of activity). Then there are some historic townships outside of the city, such as East Aurora, which are wonderful. Definitely pay the city a visit. It is really worth it. Wow...just took a few streetview tours around Black Rock. Def want to check it out. Again, impressed with the 24-7 parking, and new sidewalk trees at the curb. Apparently some great new eateries have opened up along Amherst recently. Thx for the tip. Yes Allen St is great...Hertel seems like it's coming around. Only been there a couple times. Never been to Black Rock. I'll have to check it out. I also neglected to mention the burgeoning West Side, such as the Lafayette/Ferry stretch (I am unsure if there is a name for that area), Five Points and Connecticut Streets. The area is blossoming into a wonderful multicultural scene: Burmese, Ethiopian, etc. The Grant stretch is particularly wonderful (and has one of our favorite coffee houses of all time: Sweetness 7). This is just stupid. We need this type of investment in downtown neighbourhoods so badly. I would give a nut for a local ice cream/coffee place. Perhaps a Brazil nut, or a nice Hazel nut. I own a property at the corner of Wilson and Victoria and have also run into the same high cost zoning challenges. My property also would make a great office and due to the busy traffic along Victoria, it makes it less suitable for a residence anyways! Get with it Hamilton! Hamilton is apparently moving in the direction of this, but where is the zoning laws at? Been waiting 10 years. The prospect of being hanged focuses the mind wonderfully. From 2001-2011, Buffalo lost about as many residents as Hamilton gained during the 2001-2011 period, and saw its population cut in half in the half-century prior. Hamilton's growth is arguably an impediment to its evolution. thank you for making this point. I used to think that we were blessed to not have faced the same near-collapse as Buffalo (and in theory I do believe it is a blessing to not have our city fall apart). But now I can't help but wonder if seeing our local economy completely decimated might be the only way to snap us out of the status quo. That, and amalgamation. I agree in principle with the concept, efficiencies and large-scale planning afforded by amalgamation, but I said in the late 90's that it would simply become a huge wall blocking any hopes of true urban revitalization in the old city. And here in 2013, that sentiment is proving 100% accurate. Whether it's LRT, or downtown complete streets, the suburban councillors block every initiative to invest in our poorest, oldest neighbourhoods. But they darn make sure that they get their freeways (suburban equivalent to LRT) and complete streets. Unless the next generation of staff and council can come from folks not related to the current crop, we're probably stuck. Part of the solution is for city planners not to view zoning as hard, rigid lines but as soft, pliable lines intended to direct development rather than to impede or prevent it.